It seemed a good idea to purchase a small variety of prints of my photos through SmugMug to see how they'd come out, before offering prints to other people. I was VERY happy with the results. On this page, I'll show you what I bought. This is NOT meant to be a scientific, comprehensive review. Just an informal display. SmugMug split my order into two parts: Most of the order was "Wall Art" and "Paper Prints" and was done by the "Bay Photo" lab. (These items are in the big picture below). The two "Keep Sake" items (a fridge magnet and a mousepad) were produced by the "EZ Prints" lab; these are shown at the bottom. I laid the "Art&Prints" photos out on the floor and took their group-photo. I've uploaded it at "full size" and you can right-click it to see detail. Please remember that the picture below is a photograph OF prints of photos taken under flourescent lights, and so is a bit "contrasty" and not quite the same colors as the actual prints. In spite of its informal nature, it's a pretty good representation of how the prints look in real life. And again, I thought they looked terrific. Below the picture is a list of the items. 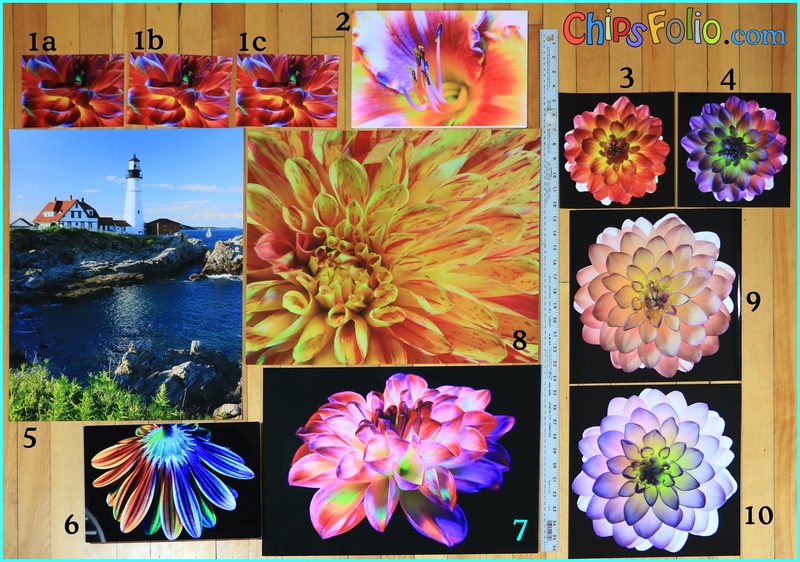 #1: From the "Studio Dahlia" gallery, here are three 5x7's of the same print. One is "Lustre", one is "Glossy" and one is "Metallic" Hard to see a difference in this photo. The "Glossy" is beautifully smooth and vibrant. The "Metallic" is even smoother, and equally vibrant. The "Lustre" seems a tiny bit less vivid compared directly to the other two, but still looks great, and is much more forgiving when it comes to fingerprints. #2: One of the "Studio Lily" series, this is a "Giclée Canvas" 8x12 board mounted print. It was the most expensive print I ordered. And it looks awesome. I also do like the strong board-backing. The whole print is about 1/4" thick. #3 and #4 are "Glossy" and "Metallic" (respectively) 8 x 8's; #9 and #10 are both "Metallic". These are all from the "Studio Dahlia" gallery. These metallic prints are very reflective of stray lights; you can see one on the print right next to the label "9". #5 (Portland Head Light) and #8 (Apple Blossom Dahlia) are both "Metallic" at 16" x 20". Detail is great in both, even when viewed "up-close". #7 (Another "Studio Dahlia") is "Metallic" at 13" x 19". #6 ("Studio African Daisy" gallery) is an 8" x 12" Float Mounted MetalPrint (High Gloss). This print just dazzles. It is pretty expensive, but really does look so color-rich, especially on the absolutely black background. The finish is so mirror-smooth, you need to be careful to hang these in places where bright objects and lights behind you won't be reflected, spoiling your view of the photo. Indeed, in my informal picture above, you can see the reflection of the top of a chair in #6, in the lower left corner. In addition to the prints above, I ordered a "large fridge magnet" and a mouse-pad. 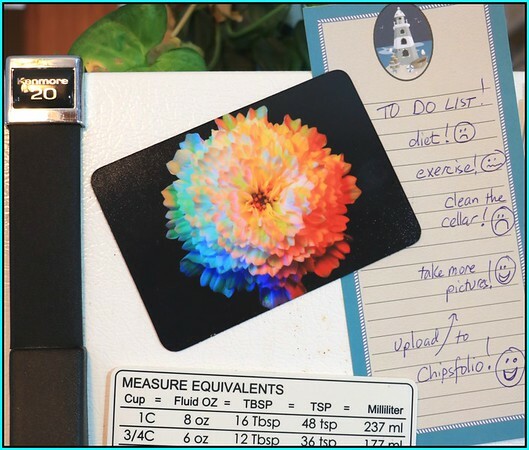 The magnet seems pretty strong and is quite colorful and makes for a great note-holder on the fridge. (this image is of a "Double-Click Cosmos" in the "Studio Variety" gallery). The mouse pad seemed to me to come out somewhat dark. 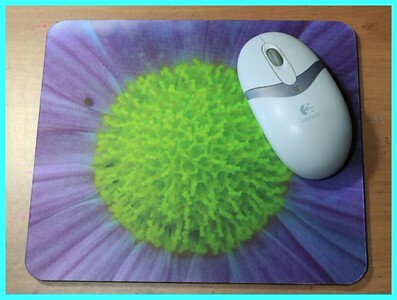 Perhaps this is because the picture (from the "Studio Chrysanthemum" gallery) itself isn't that bright, and also because of the way a mouse-pad needs to be printed, in such a way as to stand up to being run-over thousands of times a DAY by the mouse, without wearing out too fast. In any case, if you order a mouse pad, choose a picture that is on the bright-side. Also for mouse pads, you probably want to avoid photos with black backgrounds; I don't know how well an optical mouse deals with them.